Do you like pointy or round hoods? I like a pointed hood. But, they can look, well, too pointy. Since I'm writing a pattern for the hoodie pictured, I thought I'd ask my readers. So, to my few and cherished readers, please make your voices heard and take the poll to the right. Leave a comment if you need more room to expound. I did a few decreases to make the hood a little less angular. I like the way it looks here. Still, I can't decide if a round hood might not be better. I could easily rip out a few rows and rework the top. 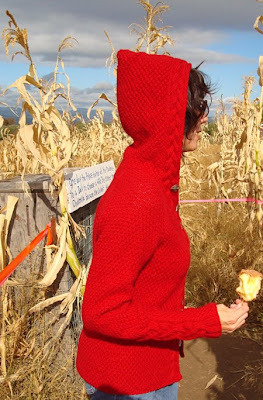 When I write that part of the pattern, I could include instructions for both a pointy and a round hood. Maybe that's the best solution. I like the elfish (elfish, right, not Elvis-h?) feel, too. Sweaters that don't take themselves too seriously are a good thing!